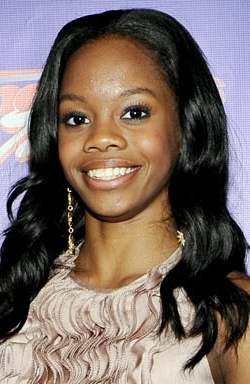 Gabby Douglas is an American artistic gymnast. 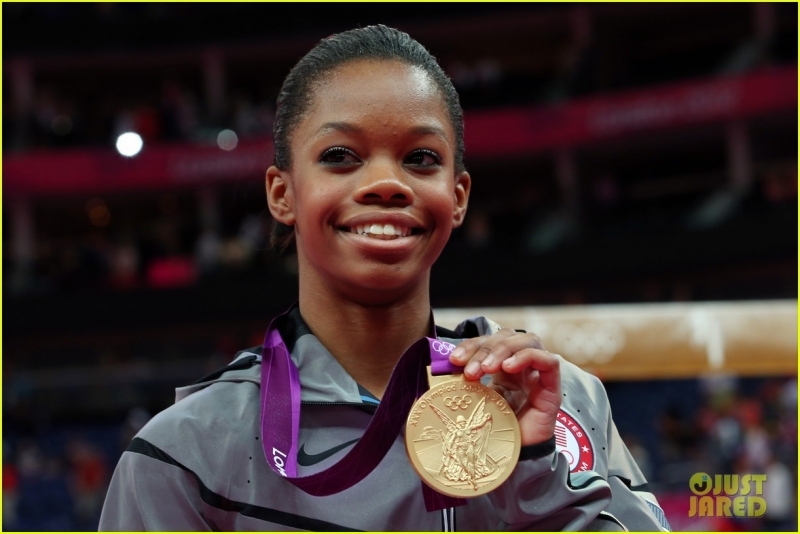 As a member of the U.S. Women's Gymnastics team at the 2012 Summer Olympics, she won gold medals in both the individual all-around and team competitions. 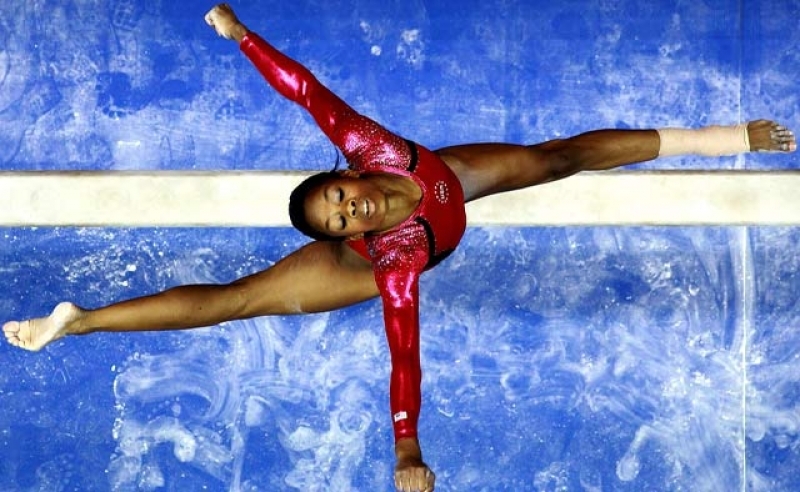 Douglas is the first woman of color and the first African-American gymnast in Olympic history to become the individual all-around champion, and the first American gymnast to win gold in both the individual all-around and team competitions at the same Olympics as well as being the only American All-Around Champion to win multiple gold medals, thus far. She was also a member of the gold-winning U.S. team at the 2011 and the 2015 World Championships, and the all-around silver medallist at the 2015 World Championships. Douglas is the first African American woman in Olympic history to become the individual all-around champion, and the first American gymnast to win gold in both the individual all-around and team competitions at the same Olympics as well as being the only American all-around champion to win multiple gold medals in a single Olympic Games. She is also the first female reigning Olympic all-around champion to return to the World Championships and medal in the all-around since Elena Davydova in 1981. Douglas was born on December 31, 1995 in Virginia Beach, Virginia, to parents Timothy Douglas and Natalie Hawkins. She has three siblings. She began training in gymnastics at age six when her older sister, Arielle, convinced their mother to enroll her in gymnastics classes. In October 2002, Douglas began her gymnastics training at Gymstrada Gymnastics in Virginia Beach, Virginia. In July 2004, Gabrielle left Gymstrada and began training at Excalibur Gymnastics. Douglas made her national debut in 2008 at the US Classic in Houston, Texas, where she placed 10th in the all-around rankings. She went on to compete at the 2008 Visa Championships in Boston, Massachusetts. Placing at #16 in that competition, Douglas was not eligible for the 2008 Junior Women's National Team. In 2009, Gabrielle suffered a fracture in the growth plate of her wrist. Due to this injury, she was largely unable to compete and missed the 2009 CoverGirl US Classic. While she competed at the 2009 Visa Championships in Dallas, Texas, Douglas was unable to perform her full routines and competed only on Balance Beam and Floor Exercise. Douglas competed at the 2010 Nastia Liukin Supergirl Cup, a televised Level 10 meet held in Worcester, Massachusetts, where Douglas placed fourth all-around. 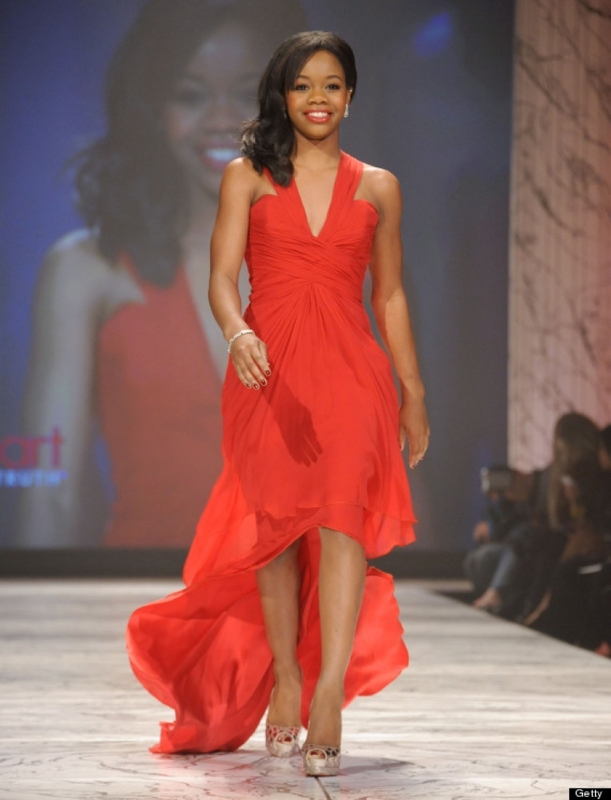 Her first elite meet was the 2010 CoverGirl Classic in Chicago, Illinois, where Douglas placed third on balance beam, 6th on vault, and 9th all-around in the junior division. In October, at age 14, Douglas moved from Virginia Beach to West Des Moines, Iowa to train under Liang Chow, the former coach of 2007 World Champion and 2008 Summer Olympics gold medalist Shawn Johnson. Although Douglas' former coach, Walker, stated in 2012 that she was convinced Douglas could have made it to the Olympics if she had remained in Virginia Beach, Douglas said, "Something clicked in my head that said, if I really want to make this happen I need to get better coaching." The impetus for Douglas's move to Iowa was when Walker had invited Chow to teach a clinic at her gym, Excalibur. Douglas was impressed when Chow was able to teach her how to perform the Amanar vault in a single afternoon. Douglas considered a move to Texas to train with a renowned coach there, but after that coach declined to train her out of loyalty to Walker, Douglas selected Chow. Chow was initially skeptical, since Douglas had been just one of hundreds of kids at the clinic in Virginia Beach. However, Chow subsequently informed Douglas's Excalibur coaches that he had agreed to train her, but pointed out that he did not recruit her, saying, "I would never recruit anybody to my program." At the City of Jesolo Trophy in Italy, Douglas won a share of the U.S. team gold medal. She also placed second on floor, tied for third on beam, and placed fourth in the all-around and on vault. Douglas earned the silver medal in uneven bars at the CoverGirl Classic in Chicago. At the 2011 U.S. National Championships in St. Paul, Minnesota, Douglas tied for third on bars and placed seventh all-around. At the 2011 World Championships in Tokyo, Japan, Douglas shared in the team gold medal won by the U.S. Douglas also placed fifth in uneven bars. At the AT&T American Cup at Madison Square Garden in March, Douglas received the highest total all-around score in the women's competition, ahead of her teammate and current world champion Jordyn Wieber. However, her scores did not count towards winning the competition because she was an alternate. Later in March, she was part of the gold-winning U.S. team at the Pacific Rim Championships, where she also won gold in uneven bars. At the 2012 U.S. National Championships in June, Douglas won the gold medal in uneven bars, silver in the all-around, and bronze in floor. Márta Károlyi, the National Team Coordinator for USA Gymnastics, nicknamed Douglas the "Flying Squirrel" for her aerial performance on the uneven bars. 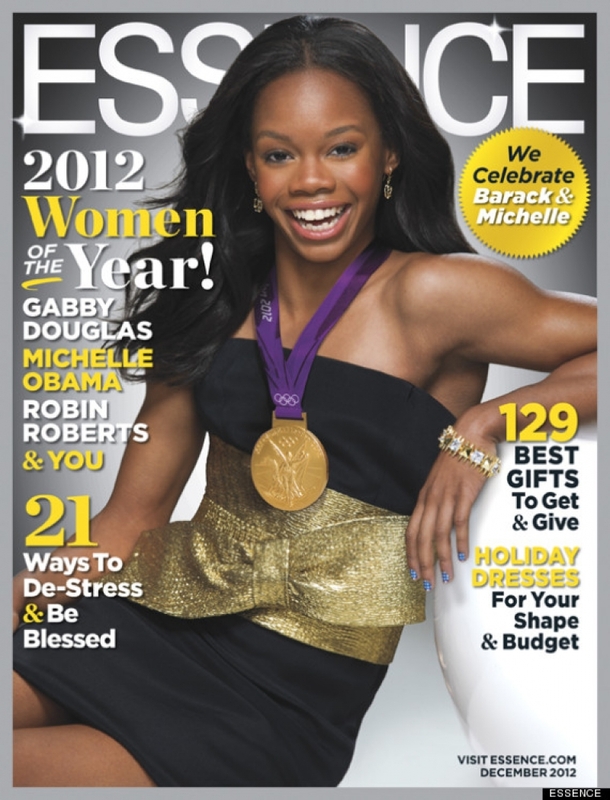 At the 2012 Olympic Trials held in San Jose, California on July 1, Gabrielle placed first in the all-around rankings, securing the only guaranteed spot on the Women's Olympic Gymnastic Team. Also in July, Douglas and her teammates were featured on the cover of Sports Illustrated Olympic Preview issue. This marked the first time an entire Olympic gymnastics team had been featured on the cover of the magazine. She appeared on Rock Center with Brian Williams on July 19, where she discussed her family background and Olympic ambitions. 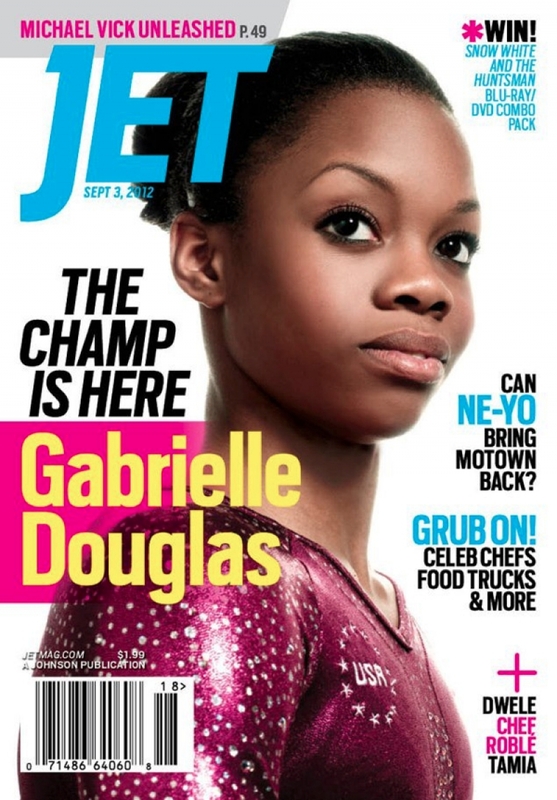 On July 20, Douglas was featured on one of five Time magazine Olympic covers. Douglas and her teammates, McKayla Maroney, Aly Raisman, Kyla Ross and Jordyn Wieber (nicknamed the "Fierce Five"), won the team all-around gold medal at the 2012 Summer Olympics. 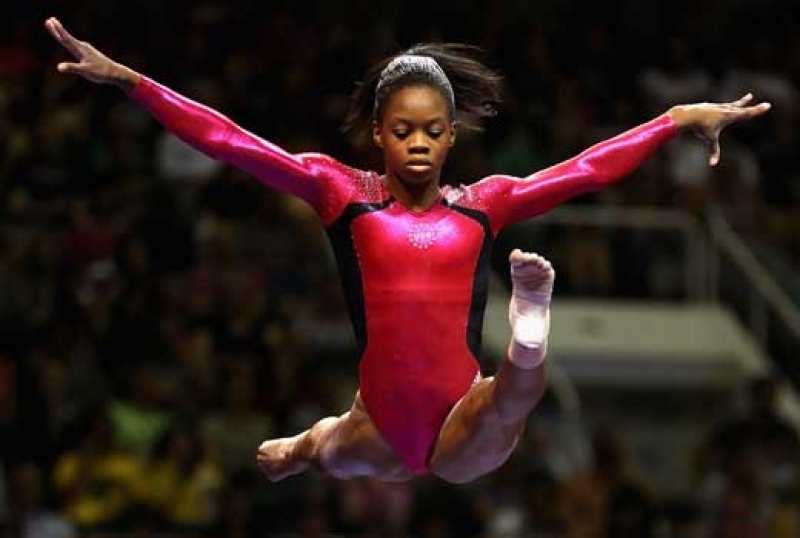 She then won the gold medal in the individual all-around, becoming the first African-American woman, as well as the first woman of color of any nationality, to win the event. 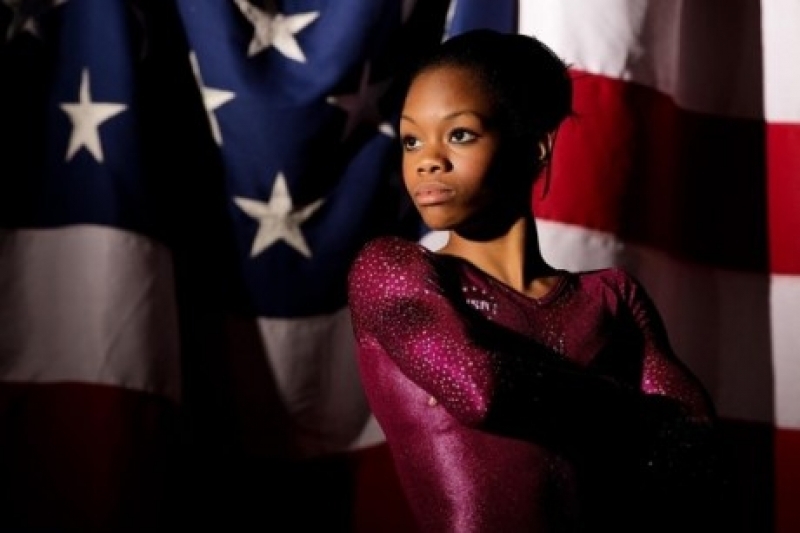 She is also the first American gymnast ever to win both the team and individual all-around gold at the same Olympics. Douglas finished eighth in uneven bars, and seventh in balance beam. She is the first all-around champion to not medal in an individual event since women's gymnastics was added to the Olympics in 1952. On August 3, the Kellogg Company announced that it would feature a picture of Douglas standing on the podium with her gold medal on special-edition boxes of Corn Flakes in the fall. This breaks the tradition of Olympic athletes appearing on Wheaties boxes. On August 13, Douglas appeared on The Tonight Show with Jay Leno, which also featured U.S. First Lady Michelle Obama. 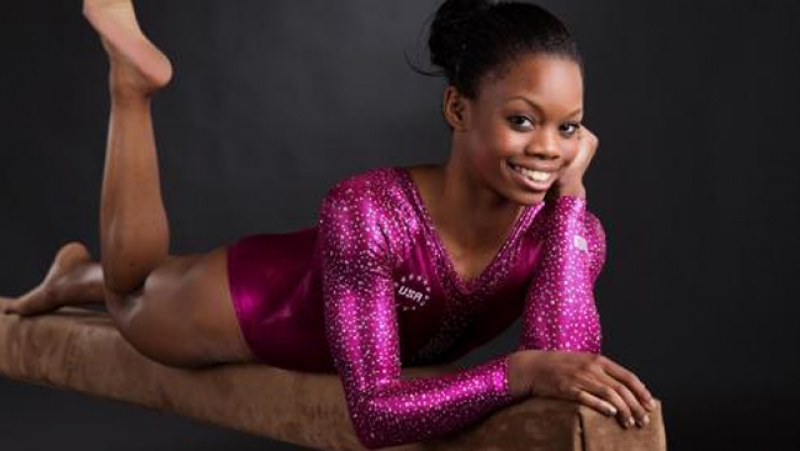 On August 26, Douglas spoke about racist bullying at Excalibur Gymnastics in an interview with Oprah Winfrey and how it nearly made her quit the sport. She described an incident in which she had heard other girls at the gym say "Why doesn’t Gabby do it? She’s our slave” when chalk needed to be scraped off the bars. The CEO of Excalibur Gymnastics, Gustavo Maure, has denied these claims. In August 2013, Douglas moved to Los Angeles to be with her family. Although she was no longer training with Chow, she said that she was still preparing to compete in the 2016 Olympics. In mid-April 2014, Douglas returned to Iowa to train once more with Coach Chow, in an attempt to qualify for the 2016 Olympics in Rio. Chow and his wife were delighted to have Gabby return to the Iowa gym, which they had not expected she would after her departure to Los Angeles in summer 2013. Gabby was to have trained alongside national team member Rachel Gowey (Sr.) and promising junior Norah Flatley, who many consider similar to both Gabby and Shawn in performance style. In mid-July, it was announced that Douglas had once again left Chow's Gymnastics & Dance Institute. She remained in the market for a new coach until the beginning of August, when news broke that Douglas would train under Kittia Carpenter at Buckeye Gymnastics in Columbus, OH. Nia Dennis, national team member, also trains at Buckeye. Carpenter announced that Douglas would not aim to return to competition at the 2014 national championships, as previously planned, but would instead train with a goal of returning in time for Worlds 2015. The stated reasoning for Douglas's delay is that she wishes to return as strong - or stronger - as when she left. National Team Coordinator Marta Karolyi, who expressed satisfaction and some surprise with Douglas's physical condition at her first two national team training camps back (while she was once again working with Chow), commented on Douglas's planned comeback in OH, "My wish is that she will be consistent in her training. And if that's what she will do, I think she will be fine. But if she jumps up and down and left and right, it will be much harder." After participating in several national team camps in 2014, on November 25, 2014, Douglas was added back to the U.S. national team, along with Olympic teammate Aly Raisman and former Chow's Gymnastics teammate Rachel Gowey. In March 2015, Douglas returned to international competition at the 2015 City of Jesolo Trophy in Jesolo, Italy. Douglas helped the USA win gold in the team competition and also placed 4th all-around behind defending World Champion, Simone Biles, newcomer Bailie Key and Olympic teammate Aly Raisman. In July, Douglas competed at the U.S. Classic and finished second in the all-around behind 2-time World All-Around Champion Simone Biles and ahead of Maggie Nichols with a score of 60.500. She had a consistent night hitting clean routines. She placed second on uneven bars behind Madison Kocian and ahead of Bailie Key with a score of 15.400, third on balance beam behind Biles and Olympic teammate Aly Raisman with a score of 14.900, and second on floor exercise behind Biles and ahead of Key and Nichols with a score of 15.000. On August 13 & 15, Douglas competed at the P&G Championships Indianapolis, Indiana where she placed 5th overall with a score of 117.950, placing behind Simone Biles, Maggie Nichols, Aly Raisman, and Bailie Key. Douglas started Night 1 on vault and despite a hop backwards on her double-twisting Yurchenko vault, she scored a 15.150. On bars, she had a high-flying piked Tkachev connected to her Pak Salto and had an excellent landing on her double layout dismount. She scored a 15.300 on bars. On beam she had a shaky routine with balance checks but did score a 14.450. On floor she had bad wobbles on her double Y-turn and her double turn with leg at horizontal (then didn't connect to her single turn with leg at horizontal). She had low landings and almost fell on her tucked full-in and scored a 13.850 to end Night 1 in 3rd with a total all-around score of 58.700. On Night 2, Douglas started on bars where she excelled once again on her inbar-stalder pirouettes and her piked Tkachev-Pak Salto connection but she took a large step forward on her double layout dismount and almost fell. She scored a 15.100. Her total bars score of 30.400 placed her 4th on the event behind Madison Kocian, Ashton Locklear and Key (by 0.100). On beam she had a shaky routine and had a good number of balance checks and lost some connections. She had a hop and a low landing on her double pike dismount where she scored a 14.200, totaling her score to 28.650 placed her 9th on the event, 0.050 behimd Raisman and Mykayla Skinner. On floor she improved her turns and connections and had better landings on her tumbling passes. She scored a 14.800 and totaled her score to 28.650, placing her 6th on the event. Douglas was named to the Senior National Team for the first time since 2012 and received an invite to the 2015 Worlds Selection Camp in September. On October 8, 2015 it was announced that Douglas had been selected as a member of the 2015 US Women's World Championship team. At the 2015 World Artistic Gymnastics Championships in Glasgow, Scotland, Douglas shared in the team gold medal won by the U.S. She also qualified for the individual all-around in 3rd place, and to the uneven bars final in 6th place. Douglas became the first reigning Olympic all-around champion since 1981 to return to the sport and win a world championships medal. On November 13, 2015, The Columbus Dispatch revealed that Douglas would participate in the 2016 AT&T American Cup, in Newark, New Jersey. It was confirmed on December 17, 2015.